Today we have a guest post by Angela Palm, who has written a lovely book inspired by old library check-out cards. Enjoy! Stories and poems have long shown readers tiny slices of the lives of others, of frozen moments in time, and of worlds-away places. I remember fondly the libraries that nurtured my love of books and that provided the backdrop for the untold fantastic travels of my mind. I remember the check-out cards tucked into the slim, manila envelopes that adhered to the inside covers. 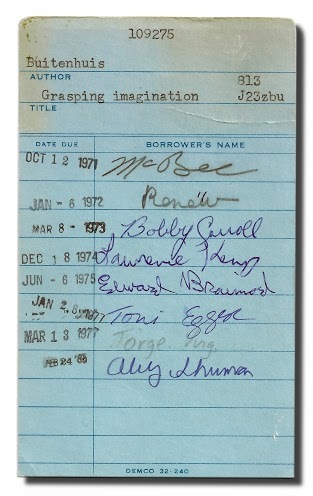 I remember standing at the check-out counter, scanning the list of names of people who had read a book before me. In some cases, I was the first to check out the book, the first to sign the card. Over a year ago, when I stumbled upon small bundles of these cards available for sale on Etsy on sites such as Erin Roof’s, those memories were unearthed. I ordered a set of ten, a set of five. Another set of ten. On and on until I’d filled a shoebox with old library check-out cards. When the cards arrived in the mail, their three-dimensional appeal further incited my interest. They felt like that past; they looked like the past; they even smelled like the past. Some who’d sold the cards were curious about my purchase—what was I going to do with them? At the time, I didn’t know. I just wanted to collect them and keep remembering. I wanted to keep discovering new pathways to imagining the past through the cards. The more I looked at the signatures, the more I wondered about the people who’d borrowed books. I studied the handwriting on the cards—some were cursive curling strokes that spread the height of two lines, others were compact and block-lettered. I imagined the personalities that went along with these styles and stories began to populate my mind. I wrote some of those stories (here’s one!) and shared the exercise with other writers. I spent a year curated those poems, essays, and stories—all sprung from these beloved cards and found the perfect publisher for the collection. The book is now available for pre-order through Wind Ridge Books, a nonprofit book publisher that forms charitable partnerships with the organization of the author’s choosing. I chose the Vermont Library Association as my charitable partner for the book, Please Do Not Remove, in hopes that it would be a small way to help keep libraries alive, physically operating in their often historic buildings, so that they may inspire others in the same way that they have inspired me. Ten percent of the book’s net proceeds will be donated to the Vermont Library Association. Are you a writer? Would you like to give this exercise a try? You can email me at angelacathleen@gmail.com to get a picture of one of the cards from my collection. I’ll be working on subsequent volumes of this anthology in other states in 2015. Let’s stay in touch and be inspired together.